Camouflage has been rising in the ranks for stylish guys for a while now, popping up everywhere from bags to shoes to blazers. But a pair of chinos might be one of the easiest ways to pull off the pattern. Tailored like a pair of khaki trousers, the camo is surprisingly versatile. While they certainly make a graphic statement, the rugged chinos pair with anything you'd wear with your run-of-the-mill tan or grey pants. Dockers made a splash earlier this spring by introducing a camo addition to their popular Alpha Khaki line. (So big, in fact, that they're introducing two new camo styles this fall.) Kansas CIty-based Baldwin is the latest to get into the game, with a pair of American-made chinos cut from Japanese cotton twill. But the real question is, what kind of camo guy are you: Traditional woodland or digicam? 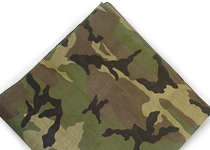 The woodland camouflage pattern, designed in 1948, was first issued to the Marines back in 1968.